I have been working closely with this East London based startup, consulting on day-to-day product design and longer-term strategy, brand and product development. Working with teams across the company I have helped ROLI grow from a small esoteric keyboard manufacturer to a consumer electronic brand selling in Apple stores around the world. ROLI products are based on the SEA interface which was developed by founder Roland Lamb. This unique technology facilitates an incredibly natural, complex, and precise computer interaction through a combination of material, sensor and software design. Finding a natural first home in expressive musical instruments, ROLI was formed, funded and an award-winning product developed: the Seaboard Grand keyboard. My involvement began with their second product, which sought to build on the success of the Grand through shifting production from their own premises to an external partner, allowing the company to reach a much wider market at a lower price. The Seaboard RISE MIDI controller was launched in 2015; it makes extensive use of extruded and CNC-cut aluminium to economically offer a range of sizes while retaining a high quality construction. Benefiting from a second round of funding to the company, the third product family aggressively pushed the possibilities of the SEA interface by adding illuminated features and introducing a dramatic reduction in size. This formed the core of a modular instrument system called BLOCKS that further expands the size of ROLI’s market with consumer-level pricing. 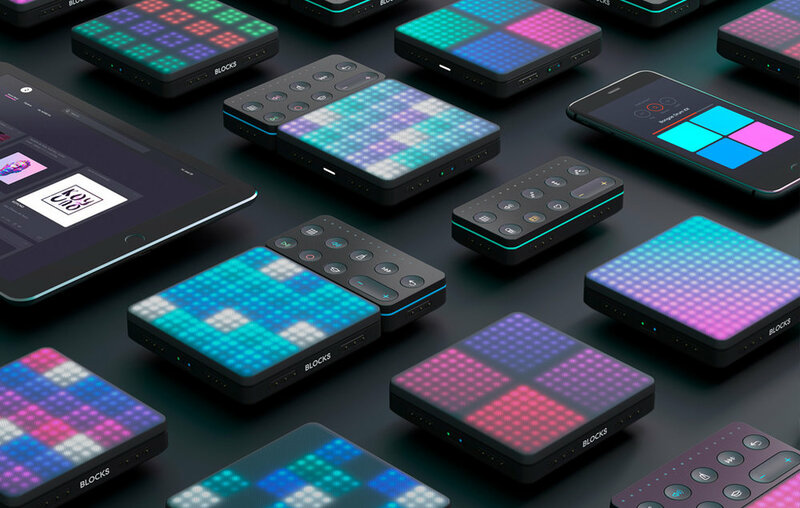 ROLI BLOCKS is a range of hardware and software with a linked social-media platform that seeks to substantially widen and democratise the process of music creation. Although music is important to pretty much everyone, becoming a creator has still involved a tough learning curve, which in other areas such as photography has been largely removed by platforms such as Instagram. Equipping the SEA interface with an illuminated interface within in a compact portable surface allows the device to manifest itself as a vast range of instruments. The interface creates a dynamic display on which responsive instruments can be presented with clear user-feedback, which facilitates rapid skill development. In combination with NOISE software and the NOISE.FM social-media platform, the system puts music creation in everyone’s pocket and on everyone’s timeline.